Get off from beaten track with new technology you always wanted to learn – CodeSchool.com gives free access to all its courses over this weekend! Online ‘learning-by-doing’ courses I attended – was it worth the money? – know the same from your side – feel free to add your thoughts on online courses. About: Linux Academy is about the Ops part of software development. It teaches basics and advanced concepts of clouds, infrastructure automation, containers and so on. Good? yes. Currently I am during the Ansible course and I recommend it. Why? There are short lectures and so called ‘server lab’ where you can create up to six cloud servers and do all the exercises on them. About: For learning web development (HTML, JS, CSS). Starting from real basics to advanced Topics. Good? yes. 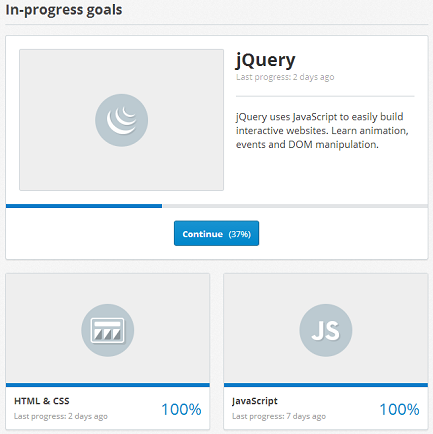 I did HTML, JS and CSS (partially also git). JS starts from real basics but ends with quite important advanced topics. Why not? Maybe first you’d like to try CodeAcademy (below) which is free. Why not? if you need advanced topics, go to CodeSchool. About: Courses teaching Design Patterns, Refactorings, Code Smells detection for Object Oriented Languages. Advanced topics for practitioners. About: various set of courses, not only for developers. I did only the Scala course there. Treehouse, lynda, pluralsight, edX. But are they even interactive courses or just a set of video tutorials? Let me hear from you! Coding is not to be learned by reading books and knowing theory, but by coding in practice. There are coding courses on these sites, however the real experience can be gathered on interactive coding lessons when you learn by doing coding. Sites that have it are CodeAcademy (free) and CodeSchool (free trials, paid when accessing more courses). There is plenty of various tutorials, videos and training materials on the web, however finding the one concise and valuable course may be difficult. Coursera is a place where you can find courses of many kinds: Arts, Economy, Education, IT and many more. These are organized and scheduled lectures with new lecture published weekly. All of them define how much time per week you need to devote (mostly it is about 4-6 hours per week). Courses are held by universities and experts. One of the best categories is Information, Tech and Design for UX experts. Some interesting courses are: Human – Computer Interaction (9weeks), Gamification (6 weeks) and Information Theory (15 weeks). All of them are totally free. The same applies to edX – a lot of world class academies and universities. Wide range of topics is surely tempting, however I did not try these courses. Some examples are: Software as a Service from Berkeley or The Challenges of Global Poverty from MIT.